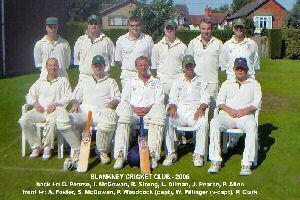 Blankney Cricket Club was originally formed in 1873 and was a popular sport watched by Lord Londesborough from the north wing of Blankney Hall. The Club continued to flourish into the 20th century but came under hard times and ceased to run around the mid 1900’s. In 1988 the club was reformed on the same site and through the hard work of its members the ground was developed and the present clubhouse was built. It was opened by the then President Mr Eric Parker Esq. in 1991. In the early years the club joined the Lincoln Mid-week League and also played friendly fixtures at week-ends. Due to its popularity the club has grown and in 1997 entered the Lincoln League Division Four (week-end league). Since this time it has won promotion on three occasions and is now established in Division One. In addition to the week-end team there are now two sides in the Mid-week League, one in Division One (which we have won on three occasions) and the other in Division Two. Despite this the club still manages to find time for a number of friendly fixtures during a busy summer. For those travelling through Blankney one can see what a beautiful setting the ground is and with a licensed bar in the Club House and a tranquil afternoon can be spent on a summers day / evening. The Club has always welcomed new players but the thinking now is that more youth should be encouraged to join. For this reason, during this winter, we are campaigning for youngsters to approach us and if we get sufficient interest we will look towards forming a youth team or teams. Proper coaching and nets will be provided for those interested. Obviously if this project is successful those who develop into useful players will replace some of the present players and with this in mind we are also hopeful of forming a second XI in the week-end league (Division Four). Having outlined our proposals we welcome contact from any potential players (whatever age). Could we please ask that in the first instance you contact Pete Ford (01526 320016).